There is a funny scene at the beginning of The Sea Hawk which explains the state of Europe in the 16th century. The English privateer Geoffrey Thorpe (Errol Flynn) — leader of a group of privateers known as Sea Hawks — captures the Spanish ship and takes the Ambassador and his niece on board. As Thorpe makes some moves against the beautiful Dona Maria, she refutes his advances and forcefully tells him that she does not talk to pirates. Thorpe smiles and asks Dona Maria how the Spaniards managed to get the Indians to part with their treasures. The speechless lady stomps away and at this very moment Thorpe, the writers and the viewers know that she has fallen for him. The movie is set in a period which is almost a century after Vasco da Gama set foot in India and a decade before the first fleet of East India Company visited Jehangir. Spain was the super power following the conquest and looting of paradise by Columbus and his followers. England’s standing in the world at that time, according to one historian, “was pretty rubbish.” Queen Elizabeth could not raise capital for any venture and made money by robbing Spanish fleets, who in the European Amway style made money by robbing people of the New World. The Queen had deputed a number of privateers (euphemism for pirate), licenced by the state for this task. This was the time of Francis Drake and William Shakespeare. This was also a time of religious wars. When Elizabeth took over, she was initially lenient towards the Catholics, but when the Catholics saved the souls of few prominent people, she took notice and outlawed the practice of the religion. Besides this she also supported the Dutch Protestants and this did not go well with King Philip II of Spain, who once was the King of England due to his marriage to “Bloody” Mary. Philip wanted to send an armada to invade England, remove Elizabeth from the throne and return England to the Catholic fold. While he was preparing the armada, Philip did not want Elizabeth to have any suspicion. It was for this reason that he sent the Ambassador and his niece to London. When she hears that the Ambassador was captured by her privateer, the ancestor of Prince William admonishes Thorpe in the court, but after that takes him to her private chamber and accepts gifts from the loot. She also approves his plan for going to the Americas and looting the Spaniards, right at the source. This turned out to be a bad idea. Conspirators in the court join forces with the Spanish Ambassador and send a team to ambush Thorpe. He is taken to Spain where he faces another great European invention — the Inquisition Court where he is sentenced to a life in the galleys. From there he escapes, returns back to London and reveals the Spanish conspiracy. This is a fun movie to watch with an array of one dimensional characters in expensive costumes, very impressive sets, with plenty of sword fighting and the 1970s Rajendra Kumar-Asha Parekh style look-don’t-touch style romance. The hero is smart, good looking, adventurous or as they say – swashbuckling. The heroine too is bold, beautiful and has of an independent mind. With a few songs, it would have made for a perfect Indian movie. In fact, parts of this movie were used in the first 70mm Malayalam movie — Padayottam (1982). Around the time of the movie’s release in July 1940, Great Britain found itself standing alone against the growing threat of Nazi Germany. Sixteenth century Spain. Nazi Germany in 1939-1940. I get the feeling that Miller and especially Koch knew what they were doing when writing the movie’s script. Especially since Spain (under Franco’s Fascist rule) happened to be one of Germany’s allies in 1940. 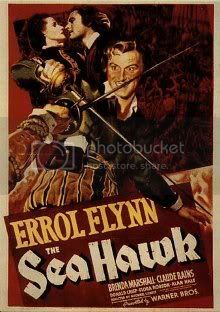 The strongest indication of ”THE SEA HAWK” being an allegory of World War II’s early years came in the form of the Queen’s speech in the final scene that hinted for all free men to defend liberty, and that the world did not belong to any one man. She might as well have been speaking to the British subjects of 1940, instead of 1588. As always, the irony escapes these British script writers.